This is a really quick project but requires a few tools. 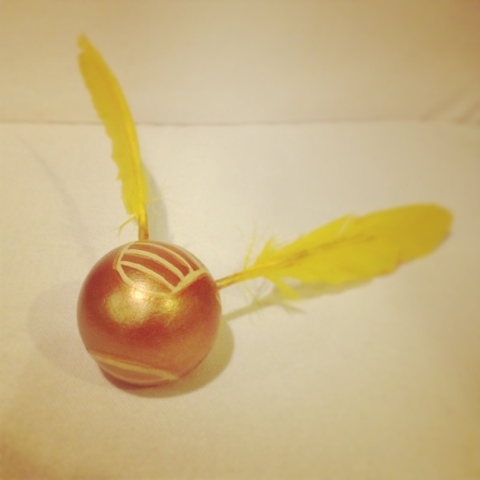 Here's how to make your own Snitch like this one. All of the above (excluding the drill, perhaps) should be available from your local craft store. Using a drill bit the same size as your feather stems, drill two holes in the wooden ball, angling the hole in the direction you want the feather to come out. Stick the feathers into the holes to make sure they fit. Use scissors to trim the feathers to your desired length. Then take the feathers back out of the holes. One hole at a time, squeeze hot glue into the hole and then shove the tip of the feather in. Before the glue cools, twist the feather so it's facing the right direction. Then repeat for the other hole and feather and let the glue cool. Using a blunt-tipped brush, paint the ball gold. To minimize brushstrokes and keep the nice wood grain visible, paint on a very light layer, let it dry, then add one or two more layers of paint until the wood color is covered. 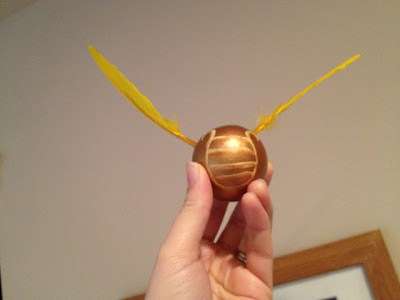 Using a fine-tipped paint brush and light yellow paint, detail on a design to give your Snitch an aerodynamic, athletic, or magical appearance. I just made up a design, but if you want you could find reference photos from the Harry Potter movies and try to create a movie-accurate Snitch. You'll note the "real" Snitch is not a completely smooth ball. To add texture, you could use gold puffy paint to "draw" the design on. Finish with a light coat of gold over the light yellow. I also edged the yellow with a darker gold to give it the illusion of depth.